The RA5 is an ultra-rugged data terminal that works with any HF/ VHF/UHF radio to provide secure data services such as email, chat, SMS and files transfer. 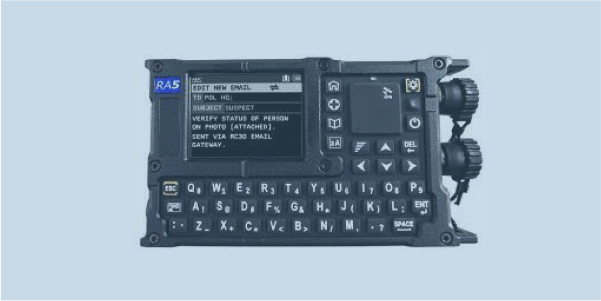 The RA5 is purpose-built for vehicle applications and for situations where PC/PDA and data modem functions are required in a rugged integrated format for first responders, security agencies, government and paramilitary users. The intuitive user interface enables deployment of secure messaging applications with minimal training. RA5 has a built-in high performance data modem that connects to virtually any HF or V/UHF transceiver via the audio interface for efficient communication in conditions when voice communication is not possible. The RA5 has a built-in GPS receiver to facilitate simple navigation functions, position tracking and emergency GPS position-based alerts.